My Australian houseguests are coming this afternoon, so until the end of May, my posts are going to be spotty at best. Here are some updated facts about the boys to tide you over for the time being. 1. 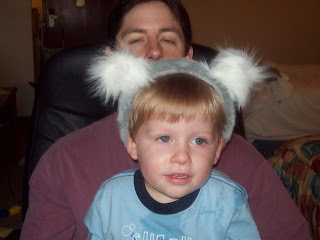 Neither boy was a big fan of wearing koala ears, but John was a bigger sport about it. 2. Sam likes to open up the refrigerator door, and drink out of the syrup bottle. Seriously. 3. John has taken his first step, but is in no hurry to take any more. 4. 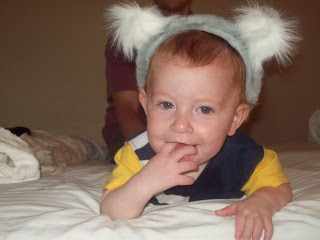 When Sam took his first step he walked across the room and hasn't stopped moving since. 5. Sam has moved up to a new class at The Little Gym. It's for 3-5 years olds (even though he's not 3 yet)and it teaches sport skills. He's loving it. 6. I can't wait for the day that Sam can begin playing organized sports. It's going to be very good for him and I can't wait to be a soccer/football/baseball/basketball/whatever mom. 7. When people ask me what John is into these days, I have a hard time telling them. Mostly, he likes to play with whatever Sam is playing with--cars, trains, more cars, more trains. But there are real differences between the boys, too. John already has some really well-developed fine motor skills and loves to play with new textures and things that require attention to detail (like Tom). Sam is more focused on the big picture (like me) and is and has always been extremely interested in all kinds of animals, whereas John doesn't seem to have a whole lot of interest in them. 8. John is getting a DVD player from us for his birthday. 9. He is having a safari birthday party because it fit in with the zoo well. Not because that's something he likes. I feel a little bad about that, because Sam's one year construction birthday party was planned around something Sam liked (construction equipment). But I honestly don't know what theme John would pick if he could. Probably Thomas, because that's all he knows. But Sam is getting the Thomas party this year. 10. Actually, Sam told me he doesn't want a Thomas party. We've been talking about his birthday party for a month now and I've been trying to figure out if he wants a Thomas and Friends party or just a train party in general. His response was, "I want a train party. Not Thomas. I like Percy. I'd like Percy for the party." But he also knows that he's going to have a party at The Pavillion and will get to ride George the Train, so he talks about a George party as much as he talks about a Percy party. So I'm back at square one. Either way, it's going to involve a train with a name. 11. I think it's awesome that Sam is old enough now to help me plan his birthday party. I've always tried to ask his opinion on things, but it helps that his opinions are very clear now. 12. I'm looking forward to going to Portrait Innovation for John's first birthday portraits. They did an amazing job for Sam's and we got the most awesome picture of Sam then. I'd like a companion piece of John in the same pose. I can't believe that John'll be a whole year old in less than a month! 13. Suddenly Sam's language skills have just blossomed. He is speaking in really long, involved sentences, like "I want to go downstairs and have some pink milk please." (pink milk = milk with strawberry syrup) Or, when I asked him, "Who is Sam?" He replied, "Sam is the handsome boy that brush his hair." 14. Tom does a much better job brushing Sam's hair than I do, and always makes him look like such a big boy. When he's finished, he holds Sam up to the mirror and always asks, "Who's the handsome boy?" Sam delights in this, proud Leo that he is! 15. Right now John is laying on the carpet with Harley watching Milo and Otis. He has a much better attention span than anyone else in the house, and has always been very happy to observe the world. Sam was never one for watching tv, but John loves it. Which is why my boys watch videos (a lot of Thomas, Toy Trains, the Wiggles, Disney, and animal videos like Milo and Otis and Homeward Bound) and never watch tv. I want them to have a rich imagination and don't want them to get sucked in by the marketing of toys on television. 16. Sam no longer calls mandarin oranges "yellows," and he can eat an entire 16oz can himself. I will miss your posts. It sounds like the boys are doing great. I need to plan two birthday parties soon too. I know I'm doing a princess themed party for my oldest but don't know what do for my youngest. fun post. it's always good to assess where your children are in their lives! and i looooove the pic of the boys in the dog cage! Kelly, since she's so little, you could do a Teddy Bears Picnic thing. That would be cute. You could have each of her guests bring their own bear for petit fours and little finger food (perfect for babies). Don't get me brainstorming on little girl parties. I'l go nuts! I get a little depressed when I think of all the superhero parties in my future. Cathy, I love that picture too. The boys went in totally of their own volition and locked the door, too. I ran and grabbed my camera! Priceless! And yeah for your own blog! When you learn how to embed hyperlinks inside the text, let me know. when i learn what imbedded hyperlinks are, i'll let you know! It's where you type a word and you can click on the word and it takes you directly to the related website... so I could finally write creative construction without having to write out the whole web address afterwards. Ahh! Something I can help with. You need to insert an HTML tag in front of the text you want to turn into a link. I had a great time seeing you guys yesterday! I also love your new blog picture of the boys. Funny and cute. Enjoy the visit with your friends, and we'll see you back here soon.